At the far left, and the first puppy born (and the one who looks most like Jessie in her coat pattern) is Asaro (named of course for Catherine Asaro, physicist and author of the amazing Saga of the Skolian Empire series). At the far right with the really funny spot pattern is Scalzi (named for John Scalzi, whose Old Man’s War series my brother and I both really love). In the middle are Tepper (named for the amazing and prolific Sheri S. Tepper, whose books I discovered in graduate school and which utterly blew my mind) and Brin (named for Davin Brin, whose Uplift fantasy series is so beloved by my brother that he very seriously tried to get me to shlep all the books in the series down to WorldCon to get them signed). All puppy genders match their namesakes. If there does end up being a Puppy #5, then it will be named (regardless of gender!) Reynolds — not for Mal of Firefly, but for Alastair Reynolds, because in my brother’s words about his book Pushing Ice, “Long journeys are the best journeys.” Let’s hope so, Possible Puppy #5! (I had the pleasure of being on a panel with Alastair Reynolds at Worldcon, and he is such an amazingly nice guy that I really hope he will not be INCREDIBLY CREEPED OUT by having Possible Puppy #5 named in his honor. I feel like Scalzi can accept this canine naming tribute in the spirit to which it is offered, and I have no basis to make a guess regarding Asaro, Tepper, and Brin, so I’m going to figure that what they won’t know certainly won’t hurt them). There will be more photos to come over the next few weeks, but I hope that everyone enjoyed meeting Whippets…… in Spaaaaaace! 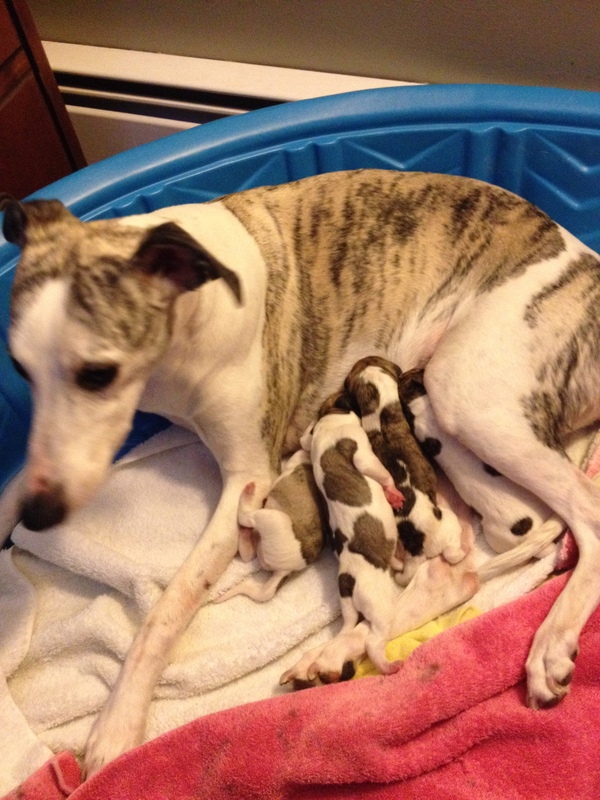 January 22 Update: Potential Puppy #5 turns out to be… not. Sorry, Alastair Reynolds! If she ever has another litter, you’ll be Definite Puppy #1! 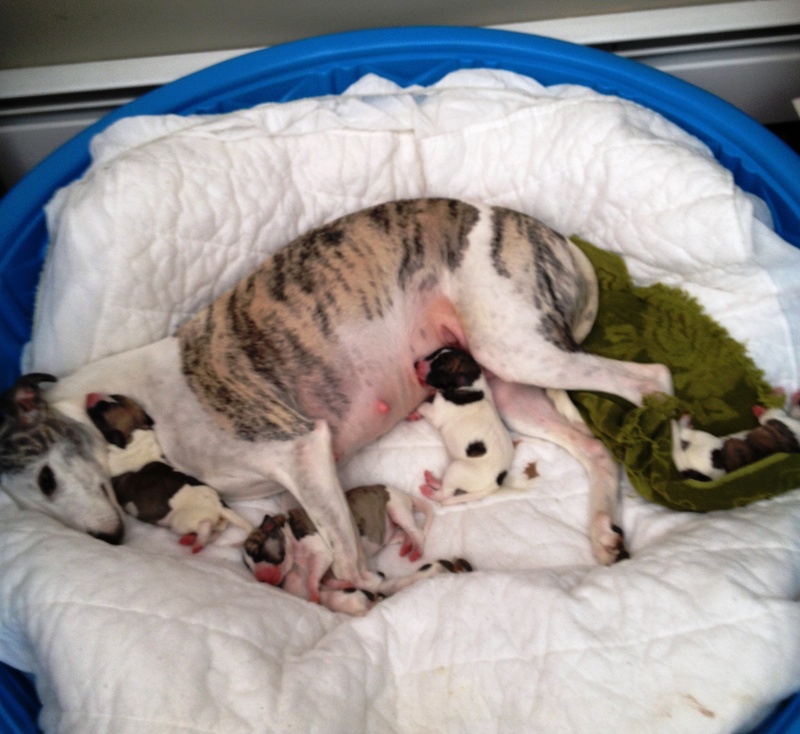 Here’s a picture of Jessie and her 1-day-old puppies! Scalzi is having breakfast, Asaro is snuggled in Jessie’s front paws, and I’m honestly still having trouble telling Tepper and Brin apart, but they’re the puppies bookending everything.